It&apos;s grilling season and we have the jump on where to find two-fisted burger goodness in Austin. Dig in and let these pros do the cooking for you this summer. 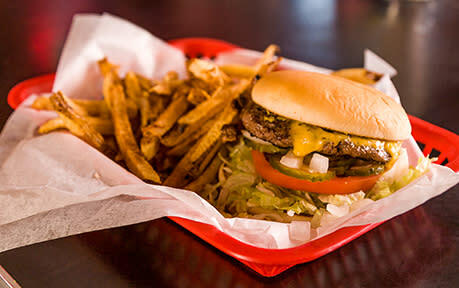 Voted Austin Chronicle&apos;s Best Burger 1995-2010, this Sixth Street neighborhood bar has been featured on The Food Network&apos;s "Diners, Drive-Ins & Dives." Their award-winning three-quarter-pound charbroiled Angus beef burgers are ground fresh daily. Try the Buffalo Burger grilled with house hot wing sauce and smothered with bleu cheese. Wash it down with a $2.50 happy hour domestic beer on the garden patio. This Austin classic has been a dietary staple of many UT student, earning them a near borderline cult following. The no-frills, diner-style setting pairs wonderfully with their no-frills prices. Chefs use only fresh USDA choice chuck patties and buns that are baked in-house twice a day. Load up your burger at the fix-your-own condiment station and don&apos;t forget the thick and crispy fries with a side of house sauce for dipping. An Austin tradition since 1973, Dan&apos;s throwback Shake Shack-style is all about family. The four Austin locations are family owned and operated and all customers are welcomed like next of kin. Dan&apos;s uses certified Angus ground chuck and hand-breads their onion rings. Choose from small, medium or large burgers and add jalapenos and bacon for a true Texas kick. Consistency and time-honored family recipes are the key ingredients here. Oh, and the chocolate malts. No burger is complete without one. This local fave goes way back - all the way to 1939 - crafting their masterpiece burgers from all natural Texas-raised beef from Johnny G&apos;s Meat Market in South Austin. Choose from buffalo, Longhorn beef, boneless chicken breast or a vegan veggie burger. Try the Mel&apos;s Number 2 with mustard, pickles and onions. Or go nuts with the Fats Domino Burger topped with lettuce, tomatoes, pickles, mayo and mustard, jalapeños, onions, grated cheddar and spicy New Orleans seasonings. On Wednesdays after 6pm enjoy two burgers for the price of one! Enjoy old school curb service and 100 percent pure beef charcoal broiled burgers at this 1971 family-owned gem. You might recognize the burger stand from its appearance in the 1993 film, "Dazed and Confused." Go classic cheeseburger or kick it up with the Longhorn Special stacked with double meat, special sauce, cheese, tomato, lettuce and onions. Select from wide ranging sides like sweet potato fries, fried okra and sweet buttered corn. Some say it looks like a scene straight out of "Happy Days" or the movie "Grease." Serving up beloved burgers since the 1940s, Sandy&apos;s keeps it simple with a straightforward menu centered around juicy, gigantic cheeseburgers. The old-fashioned frozen custard also gets rave reviews. Try the butterscotch. On Thursdays, take advantage of the burger, fries and drink special for around $5. John Martin opened Martin&apos;s Kum-Bak in 1926. The quaint joint served delicious hamburgers and shakes, had a dirt floor (hence the name "dirty"), eight bar stools and a small drive-through. Today, chefs serve fresh-never-frozen beef, homemade onion rings and French fries and icy lemonades and limeades. Try the chili cheeseburger smothered and topped with cheddar, dine on the front or back patio, and don&apos;t miss happy hour Monday through Friday 3 to 7 p.m. for $2 pints. Austin&apos;s last remaining drugstore with a bona fide soda fountain and grill, Nau&apos;s Enfield Drug is a historic landmark. Since 1951, the icon has been drawing locals in with simple burgers made with mayo or mustard, lettuce, tomato, onion and pickles. Choose from small or large sized burgers and treat yourself to a Coke or Dr. Pepper float or an extra thick banana milk shake.